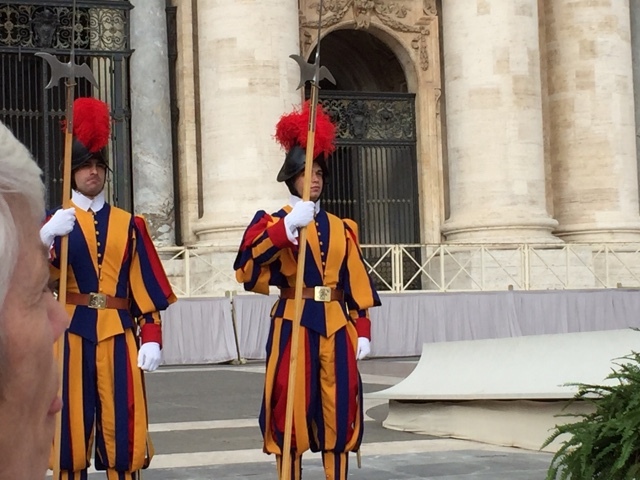 Wandering and Wondering: Second full Day in Rome -- We met the Pope. 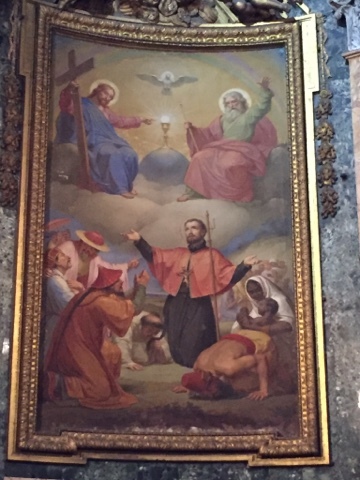 Join me as I wander around the Diocese of Los Angeles. 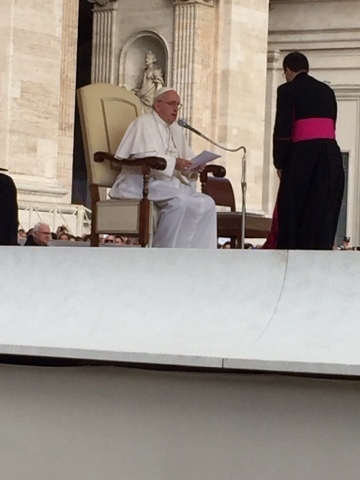 Second full Day in Rome -- We met the Pope. Well, to say my life was made today would not be an exaggeration. 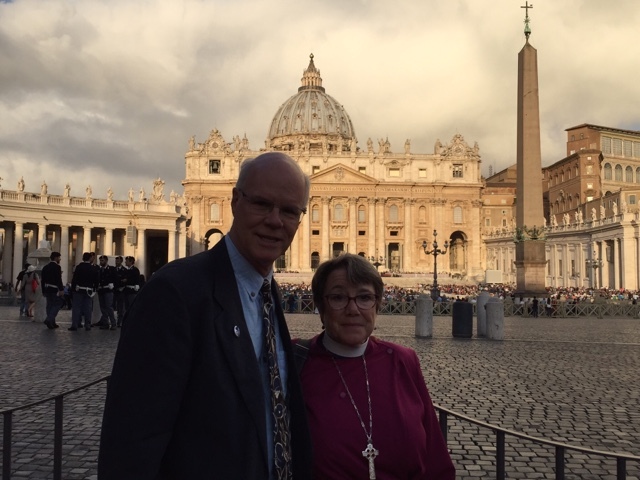 We had to get up early (no problem there -- I'm still on Korea time) -- and be at St. Peter's Square no later than 7:50. 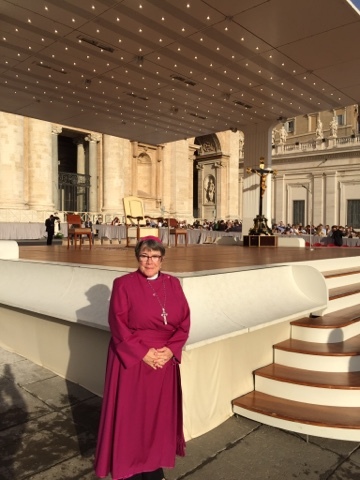 We were there and ready -- cassocks and for me, zucchetto. We waited under the sun for a while -- it was warm but not unbearable. Steve had me plied with water -- our spouses were behind us behind a barricade. There must have been 10,000 people in the square if there was one. See the chairs on the left side of the picture? That's where we sat. See the white chair on the platform? 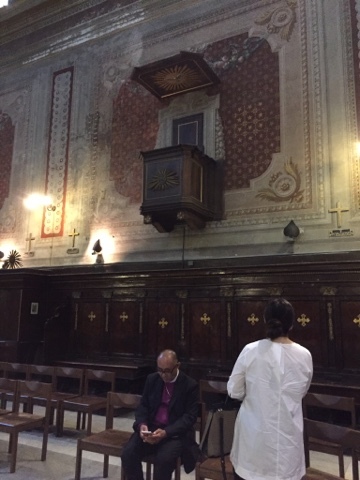 That's where the Pope sat. Yep -- we were THAT close! The Pope started by having the "Pope mobile" drive him around the square -- he blessed children, shook hands -- you name it. He was accessible and you can tell is very much loved. 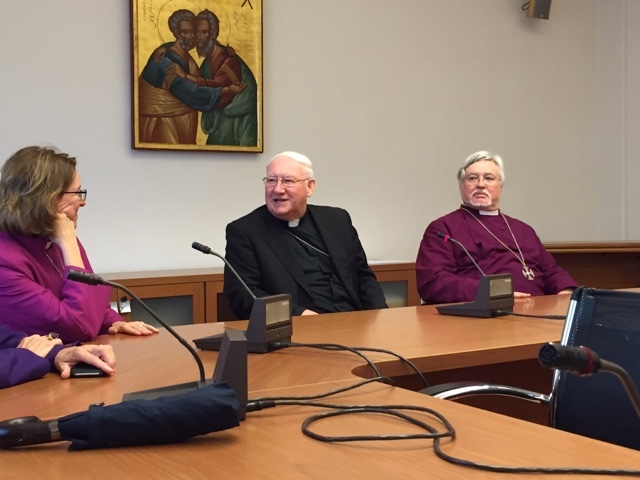 We spoke to two Roman Catholic Bishops who came over to greet us warmly. One other came over afterwards, and then one other. That was kind. 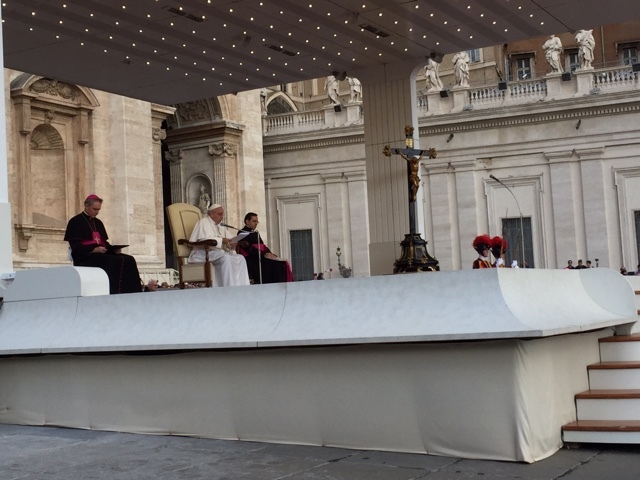 The "Pope mobile" made its final round around St. Peter's Square and then El Santo Padre made his way up to his chair with wild screams from the mobs of people there. There was a reading in severeal languages, then the Pope responded with a message. 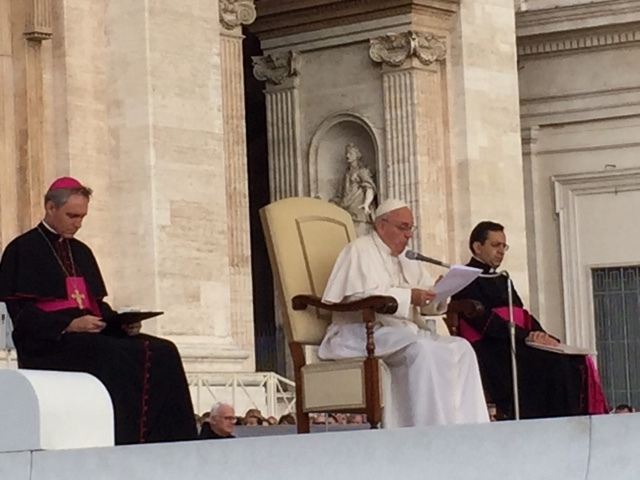 The essence of the message (the full message the Pope offered in Italian) was offered in various languages. Time came for audiences. 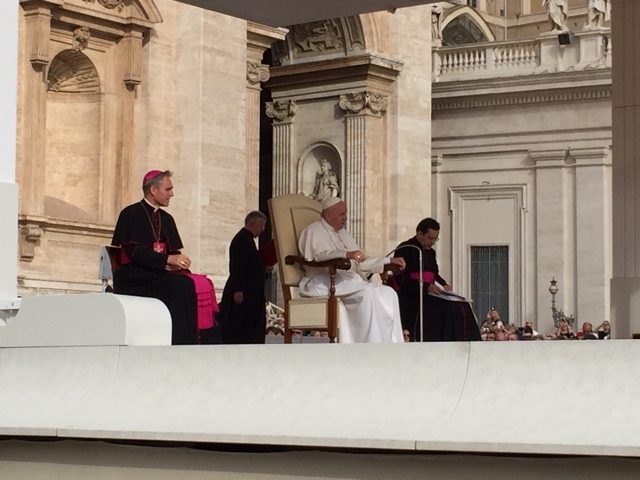 The Roman Catholic bishops went up first -- and they all greeted him warmly, and he them. They met him up at his chair. He came down to the bottom of the steps to meet us. I think it is because he saw I was using my cane. When he got to me, I greeted him in Spanish, gave him a Laundry Love pin and told him about this ministry -- I asked him to pray for us and he asked me to pray for him. I had to do it very quickly! 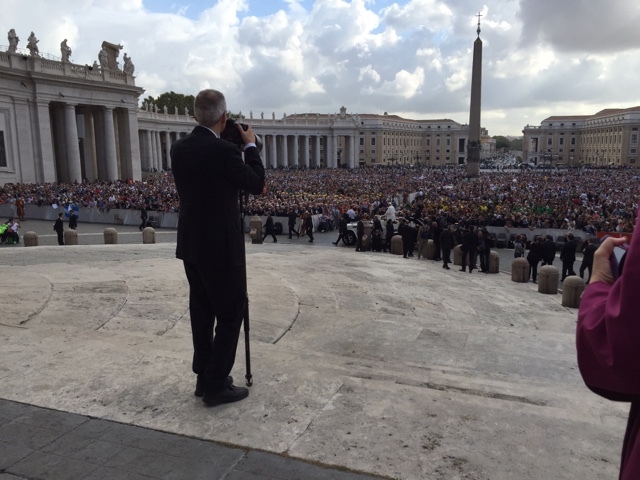 A suprise when I woke up this morning is that some photographer for a website which has a Facebook page -- Famiglia Cristiana -- who was behind us got a shot of me turning to walk away -- the Pope still smiling. 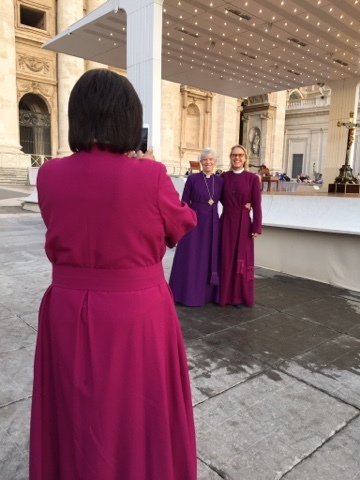 It is not the official Vatican photo which I will hopefully get in the next few days -- but I think in my heart it is the capturing of a special moment, and I"m grateful for the photo. I cannot begin to express my feelings about this moment. Growing up as a Roman Catholic, it was always a dream to one day meet the Pope. 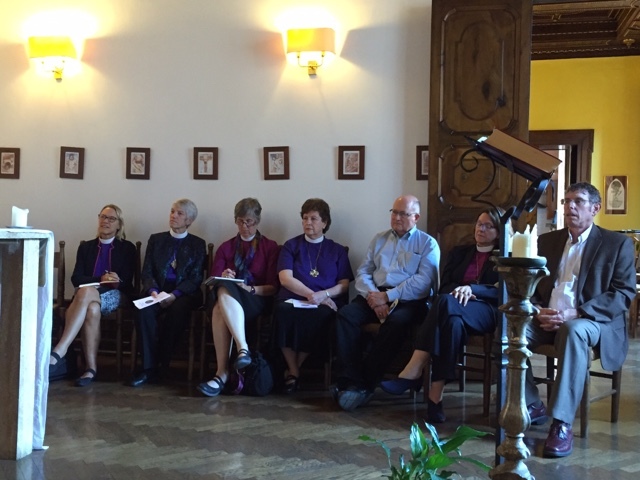 Even as an Episcopal Bishop, I never thought I'd have this opportunity. Yet, Bishop Pierre Whalon helped make that happen. We were front row -- just being that close and hearing him would have been enough. Being able to shake his hand and tell him about a ministry we do for the poor and to share that small pin with him was a great gift to me. 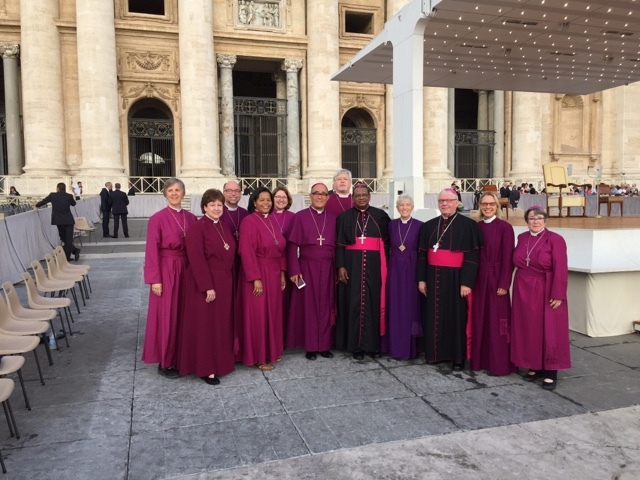 People asked to have their picture taken with us -- we were a bevy of women bishops -- and something many of them had never seen before. It took a while for us to be able to exit the grounds. 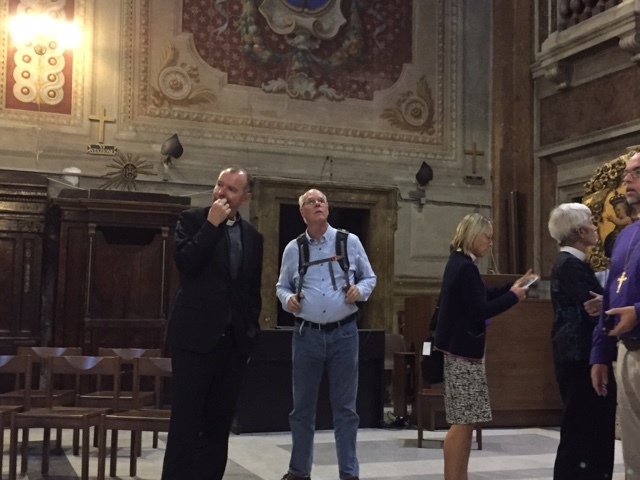 We were going to go into St. Peter's once the Pope left to go in but some of the bishops wanted to get changed out of their cassocks. So we had to find a way out! We finally did. We went over to a restaurant and had lunch. It began to pour down rain! Heavy, heavy rain -- but it didn't rain on us during our time with the Pope -- amazing. 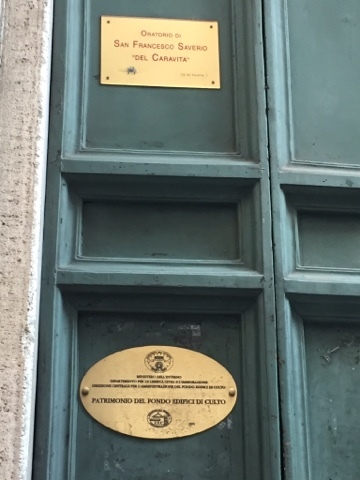 As lunch was ending we literally had to move next door to the Pontifical Council for the Promotion of Christian Unity to meet with Bishop Brian Farrell. 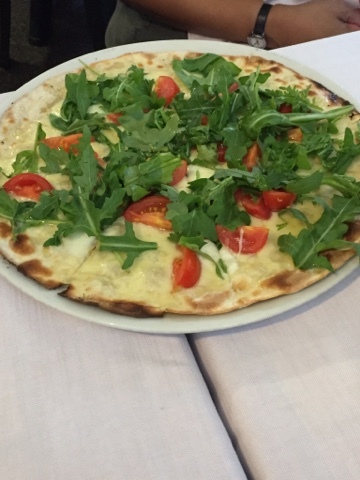 It was ideal that we ate where we ate because we literally walked out one door and into the next. It was great to meet him and talk about the work they are doing and their relationship with various churches including ours. 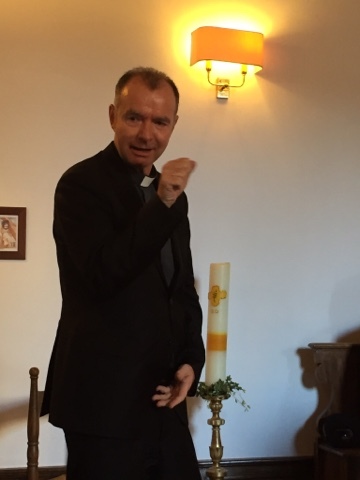 We then went back to our hotels to get out of our cassocks and to put our feet up for a few minutes before we headed out again. about the history of the Center and the work the Center does. What a great gift! He then went on to tell us about the history of the palace that the center is housed in (no, it doesn't take up the whole thing -- this particular palace was a hub for social justice through the centuries, including openly defying Mussolini, which caused the then prince to be sent to a concentration camp. After the war, the American Government installed the prince at the Mayor of Rome. 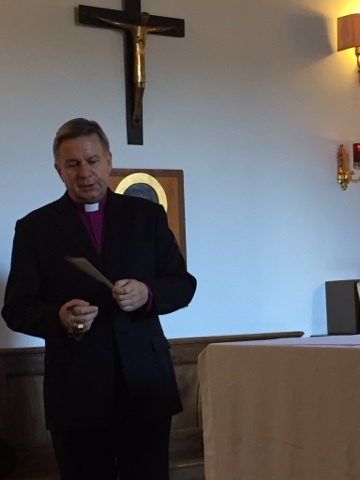 Archbishop Moxon then introduce the Rev. 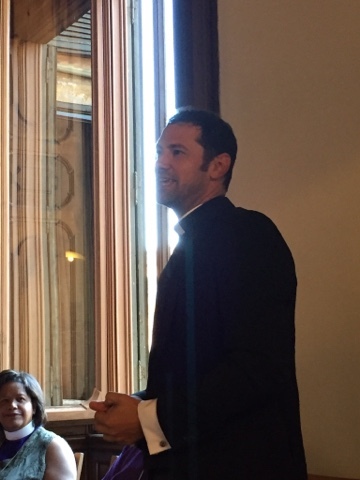 Austin Rios to us -- some of the Bishops already knew Austin. 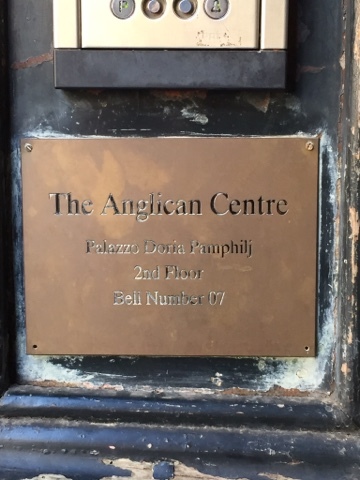 He is the Rector of St. Paul's within the Walls. 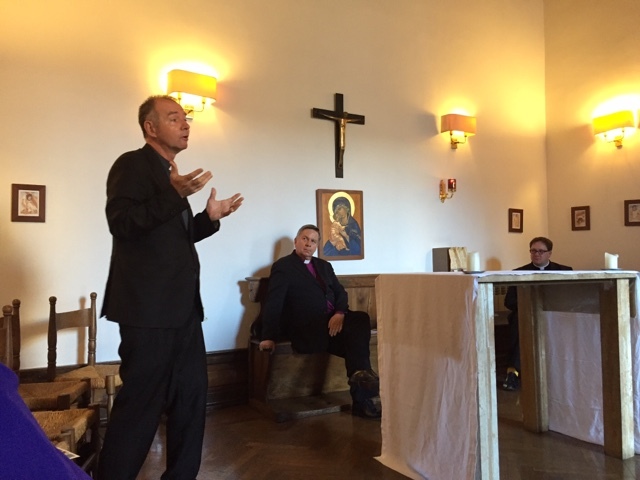 He spoke to us also about the Center and the relationship to St. Paul's. We were then introduced to the Rev. 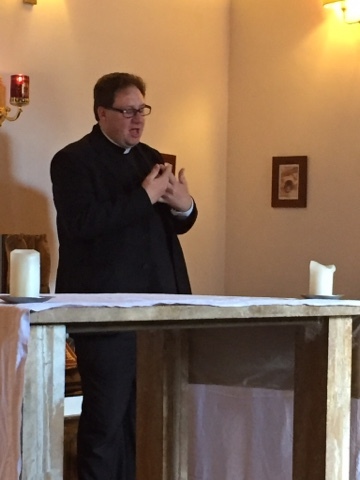 Dr. Keith Peckler, SJ -- a world renowned liturgist and professor. 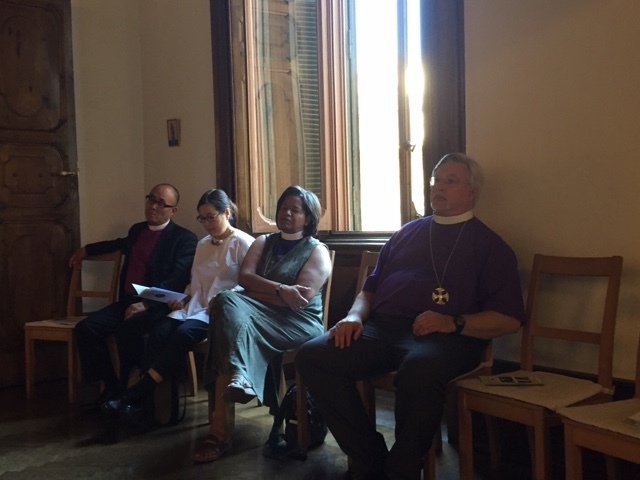 Keith told us about some of the dynamics of living in Rome and working in ecumenical circles. The Rev. Marcus Walker also spoke to us. Marcus is the Associate Director of the Center. What was interesting is that I hadn't fully realized the scope of the work of the Center, nor the fact that they offer courses of study and have a retreat area to stay. I am tempted to spend a little bit of my sabbatical time here next year! thought it was a protestant church by the way the chairs were situated. He took us over there and we were able to spend a little time there. 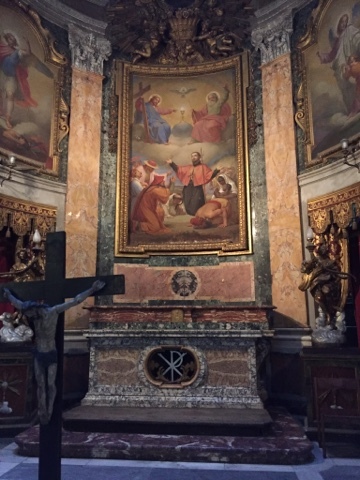 The painting behind the altar is that of St. Francis Xavier. We went for a snack/dinner and something to drink before separating for the rest of the evening. This was a VERY full day! 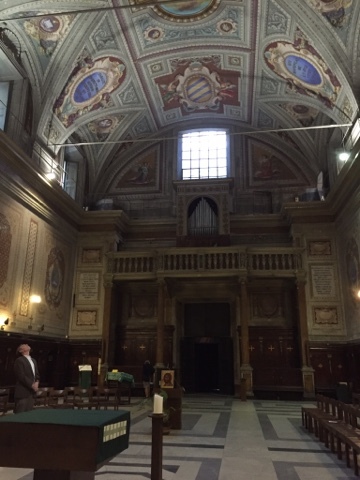 Tomorrow -- the Church of St. Clement of Rome. All I can say is, "I still can't believe I talked directly to the Pope." I feel your excitement and am so happy you have had this experience with Pope Francis. Beautiful photos and description of your perfect day. Thank you for sharing. I can empathize with your emotions. 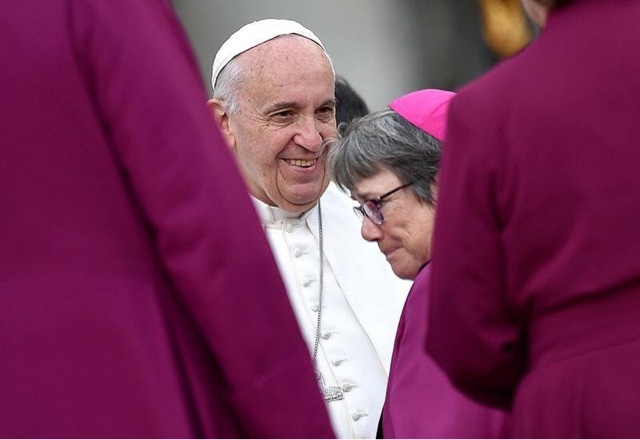 And I wonder how francis felt meeting this particular group of bishops. Again, thank you for sharing. 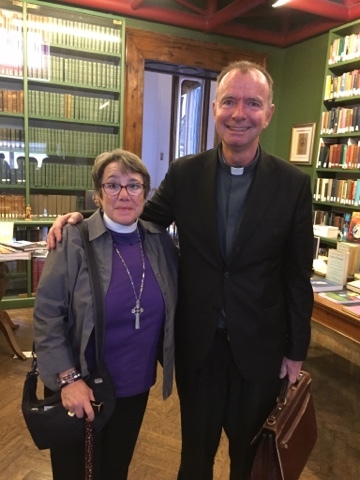 Lovely you met with ++David Moxon (NZ) too. As always,I am in awe of how much you pack into one day. For we mortals, "meeting the Pope " would be the whole agenda for the day. Hi! I'm glad you're here! Come on in, pull up a chair, and see where my travels have been taking me. 1. Devout follower of our Lord Jesus Christ. 2. Happy member of the Episcopal Church. 3. Loving wife to Steve. 4. Proud mom of Max and Jardine. 5. Grateful friend to, well, you know who you are! 6. 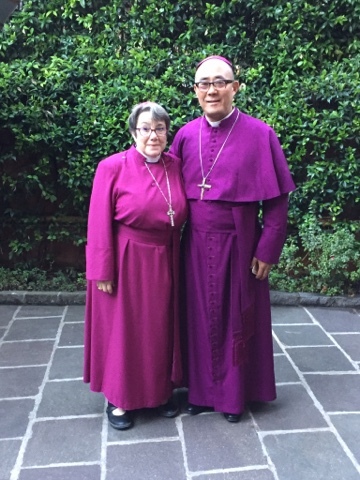 Honored to be among the Bishops as one of the Bishops Suffragan in the Diocese of Los Angeles -- consecrated May 15, 2010. Loving doing mission and ministry with people in the Diocese of Los Angeles. 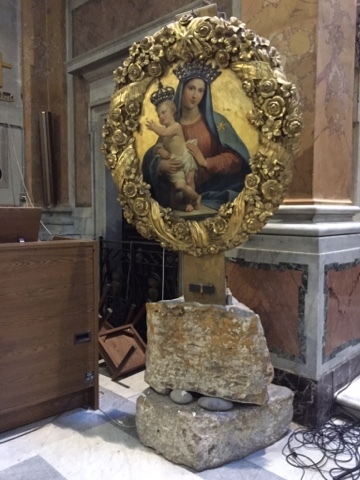 This blog is designed to lift up and honor the people and congregations in the Diocese of Los Angeles that are assigned to my areas of responsibility or to whom I go for formal visitations. It is not designed as a vehicle to take political or theological stands. If you wish to reproduce anything written here or link to another site, you may only do so with the express permission of the author, and only with appropriate attribution. Day One Vacation Time: Paris! Day Two Vacation Time: Gems of Paris tour day. 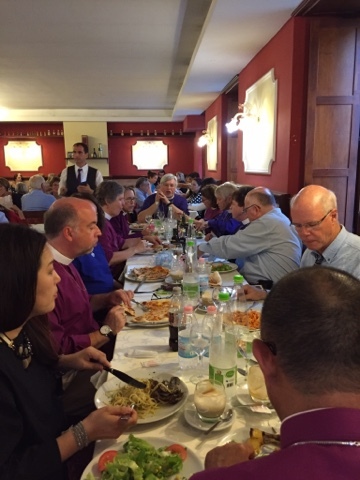 Day Six in Rome -- Church on Sunday! Seoul -- Day Seven -- last full day.